Designed to accommodate lateral transfers. Cantilevered arm design drops with just a push of a button, allowing unrestricted left-to-right leg movement for easy transfer. Hard, chrome plated steel frame is rust resistant and offers greater durability. A cost effective solution with a non-padded round seat. Foam handgrips won't slip, even if wet. 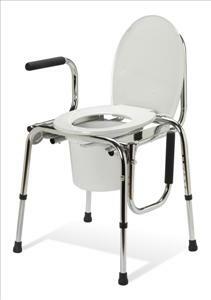 Backrest can be removed for use as an over-the-toilet safety frame. Pail, lid and splash guard included. Height adjusts 18.25"-23.25". Weight capacity 300lbs. Lifetime limited warranty.